Creating Japan’s Ground Self-Defence Force, 1945-2015: A Sword Well Made. David Hunter Chester. Lanham MD: Lexington Books, 2016. For some Americans, especially those of a certain generation, the image of Japanese military tradition is one of caricature. We see cartoon samurai and Godzilla when we close our eyes and imagine Japan. But Japan has a warrior tradition that is among the most rich and storied in the world. This tradition leads to the other image many have of the Japanese military: unfathomable determination and savagery of the Imperial Japanese Army and Navy during the Second World War. Warriors and military leaders ruled Japan for 800 years until unconditional surrender and a new constitution brought that rule to an end. The story of what came after is one that has been largely forgotten or ignored by the United States and the West. Considering the involvement of Japan’s Ground Self Defense Force in the Iraq War was the first time since 1945 that Japan authorized troops to a combat zone and the ongoing tensions in the contested Senkaku Islands. It is a story unlikely to remain either forgotten or ignored any longer. Near the beginning of Creating Japan’s Ground Self-Defence Force, 1945-2015: A Sword Well Made, author David Hunter-Chester recounts the story Representative Yamazaki Iwao told during Diet proceedings on the draft of Japan’s postwar constitution, from which the subtitle of A Sword Well Made is taken. The story goes that during the reign of Emperor Temmu the Sacred Sword, an imperial treasure, was stolen from the shrine that held it. The Emperor’s court sent out a force of men to retrieve the sword and managed to recover it once a storm beached the thief’s boat. The sword was returned to Emperor Temmu’s possession, but immediately he fell ill. He consulted a seer who told him the sword had been cursed, and once it was returned to the Shrine where it was normally kept, the emperor recovered and achieved a noteworthy reign. Yamazaki continued to explain that all of the aggressive actions taken by Japan to provoke war with China were all caused by the curse of the sword. This includes the Manchurian Incident which was engineered to give Japan a pretext for beginning its invasion of China through Manchuria, the Shanghai Incident which gave Japan a casus belli for continuing its aggressive invasion into China, and the China Incident which marked the beginning of the Second Sino-Japanese War. Now that Japan was wise enough to discard the sword for good, it could finally build a splendid state. This story serves as a metaphor to describe the disarmament of Japan and serves as a starting point for the reconstruction of Japan’s Ground Self-Defence Force. This is a good metaphor to use for the basis of the story because the Imperial Japanese Army and Navy were the cursed Sacred Sword referenced in the story and instead of returning the sword to the shrine where its curse could possibly affect Japan some years down the road, the sword was shattered. Hunter-Chester continually refers back to it and uses the image of a forging katana when discussing the various phases Japan’s Ground Self Defense Force went through to reach its modern iteration. The story for Japanese disarmament begins before World War II had even ended. The savagery and tenacity of the Imperial Japanese Army and Navy as experienced by the United States and the Allied forces in the Pacific left many officials wondering how to deal with the Japanese state when the war eventually came to an end. Propaganda in the United States during the war reinforced the idea that the Japanese were inhuman killing machines capable only of butchery. Due to these beliefs and in order to make sure this never happened again, a variety of ideas from the stripping of Japanese industry to the forced sterilization of all Japanese males living in the United States to genocide of all Japanese were floated as a way to permanently solve the problem of postwar Japan. In the end, however, these more extreme ideas were put aside in favor of disarmament. The language for disarmament went through many iterations before being accepted as Article 9 of the constitution which governs Japan to this day. In 1946, the passage of the new Japanese constitution and Article 9 shattered the Sacred Sword that was the Imperial Japanese Army. Its pieces scattered to the wind, never to be reforged. In the eyes of the Japanese who supported and pushed for the adoption of Article 9, weapons of war and military ambition just brought pain and agony to the nation of Japan. Now, the Japanese people were to transcend militaristic ambition and become an example to people around the world. Despite this idealistic notion used to sell Article 9 of the new constitution to the Japanese people, the frosty air of the Cold war and the need to fortify Japan as the United States went to war in Korea pulled Japan back into reality. The Japanese Ground Self-Defense Force did not always exist in its current form. It went through various periods of change and transformation, all of which the book explores in great depth. The Japanese Ground Self Defense Force began as a constabulary force designed to police the streets as American forces in Japan were sent to fight in Korea. However this proved to be the start of a journey on which a new sword was forged in Japan. After becoming a constabulary force whose forces comprised of old Imperial Japanese Army veterans and young men who never picked up a weapon. Yet, despite a favorable view from those in the Japanese government and the United States to rearm to a degree, a struggle began within Japan about whether or not weapons were truly needed by Japan. This led to Japan pursuing the Yoshida Doctrine, which pushed to limit military spending as much as possible and utilize the stationing of U.S. troops on Japanese soil for defense as much as possible. Japan would gain its independence in 1952, the most tumultuous period for the Japanese Ground Self Defense Force occurred, with deadly riots happening around the country over the topic of rearmament and defense spending continued to be curbed in spite of changes to the constitution recognized the right Japan had to establish and maintain armed forces. It was also during this phase in the construction of Japan’s Ground Self Defence Force that the would rearmament took on a negative connotation in Japanese society. Throughout the Cold War, Japan struggled with rearmament, with some policymakers and member of the public fearful that Japan would take up the banner of militarism once more. After the Cold War ended, a new debate raged about what forces the country should maintain now that the threat of communism was gone. The Japanese spent 13 billion dollars during the first Gulf War and while it sent troops on peacekeeping missions, Japanese troops saw their first experience in a combat zone since 1945 when they were deployed during the Iraq War. The author covers the Japanese Ground Self Defense Force's journey through the time periods mentioned also explores the perceptions and representations of the Japanese Ground Self Defense Force in popular culture such as manga, anime, and movies like Godzilla, where Godzilla embodies the spirit of the Japanese Self Defense Force in the way he defends Japan. 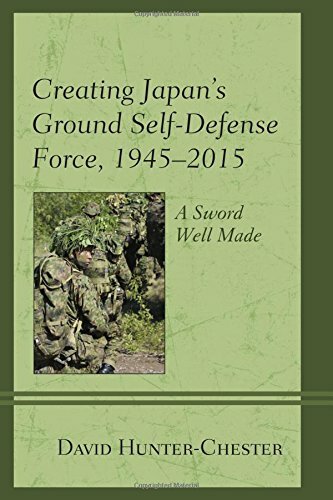 Creating Japan’s Ground Self-Defence Force, 1945-2015: A Sword Well Made is unique in the way it captures all of the major and minor players who took part in shattering and reforging the Sacred Sword that is Japan’s Ground Self Defense Force and puts all of that information into an all encompassing format. For the reader to understand the numerous details and fully appreciate the first person accounts, the reader needs to have a general understanding of Japanese history. In addition, the reader needs to understand this book is written from a Japanese perspective; thus many details regarding atrocities are glossed over, or simply not mentioned. This book has value for those who wish for more than just a Japanese perspective on the reconstruction of Japan after World War II and during the Cold War. The book is also valuable in the picture it paints of how difficult it truly is to create/recreate an army and all of the cultural and social nuances that are required to help its integration into society. This can be helpful to those wishing to gain further insights of the struggles undergone by during the reconstruction of Iraq and Afghanistan, both of which needed to completely rebuild their armies. After reading this book, Godzilla has taken on a new meaning for me. Sean Duffy is a graduate from the International and Comparative Politics Masters Program at Wright State University in Dayton, OH. His thesis cover the rise and development of the United States drone program from 2001-2012.